Chania, the city that combines everything! 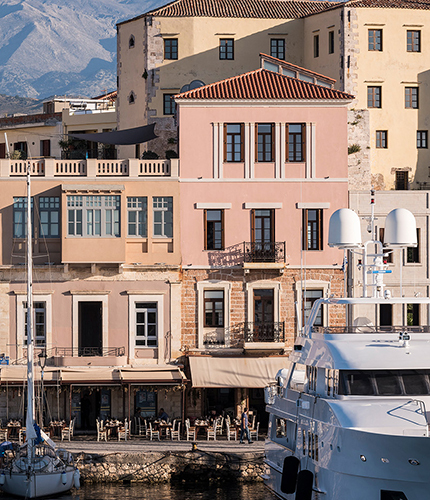 At the heart of the charming old Venetian Port of Chania, our boutique hotel brings you closer to the magic of the Old Town. Wander through the very same alleys that Venetians, Arabs and Turks have walked on over the centuries and take a fascinating travel down history lane. Feel the charm of its tight cobblestone streets and Venetian mansions, and try to unravel their secrets. Mind you, though, the Old Town always offers new flavours and aromas. 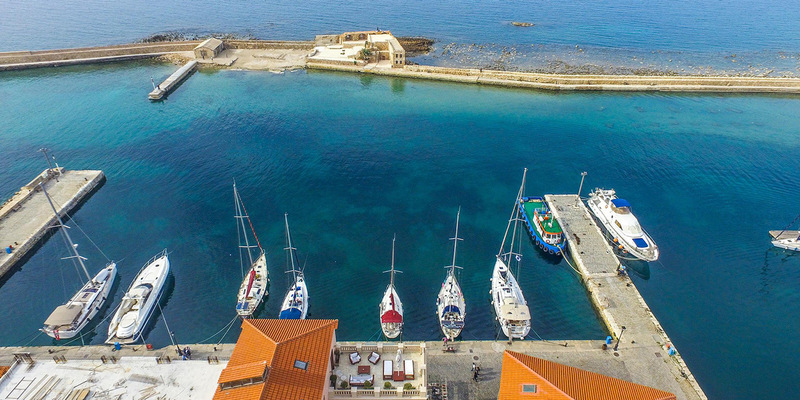 Over the centuries, Chania has attracted a slew of different cultures that each left a mark of their own legacy all over the city. A melting pot of diverse cultures, customs and habits waiting to be discovered. Ambassadors Residence Boutique Hotel is an ideal retreat for couples in love that want to relax and live romantic moments, away from everyday life routine. Get some rest in your room, relax in the jacuzzi or on your private terrace, or savour amazing Cretan cuisine and local wines on your own balcony. Cretan hospitality and a swathe of enchanting scenery that stretches out in front of you are ideally combined to make your stay unforgettable. Should you wish to get out for a walk, we recommend a relaxing stroll along the harbour, where gentle waves lap against the shore, soothing your mind. Capture the moment in a photo with the Lighthouse, the Old Port symbol, as your backdrop. Chania offers its guests a variety in amusement and entertainment. Full of mystery, surprises and juxtapositions, the city boasts both aspects of everyday life, traditional and modern. Cafés, restaurants, music scenes, clubs and bars are all at your disposal to suit your mood. 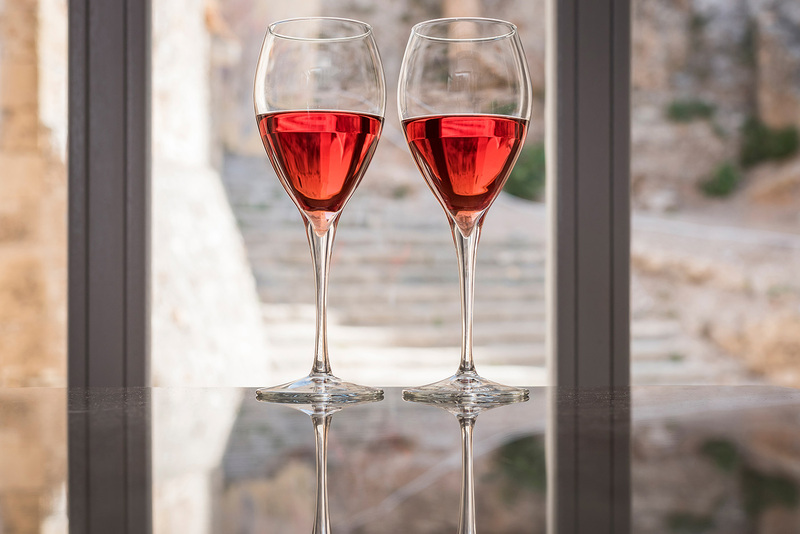 Especially in the summer, the city’s visitors mingle with the locals; they make friends and have fun enjoying the raki and the local aperitifs. Those interested in the city’s cultural events, have the chance to attend art festivals, theatrical performances, concerts, balls and so many other intriguing events, organised every summer. Chania also boasts a large number of shops to buy souvenirs for your loved ones, as well as jewellery, clothes, shoes, local traditional products or anything you may like. 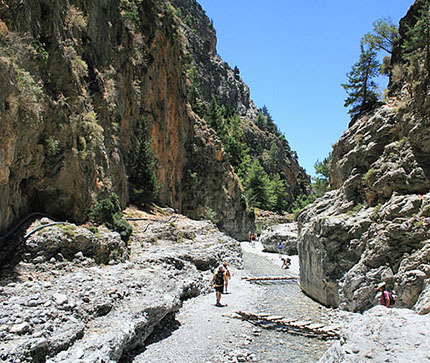 Samaria is the most famous trekking gorge, not only in Greece but also all over Europe. 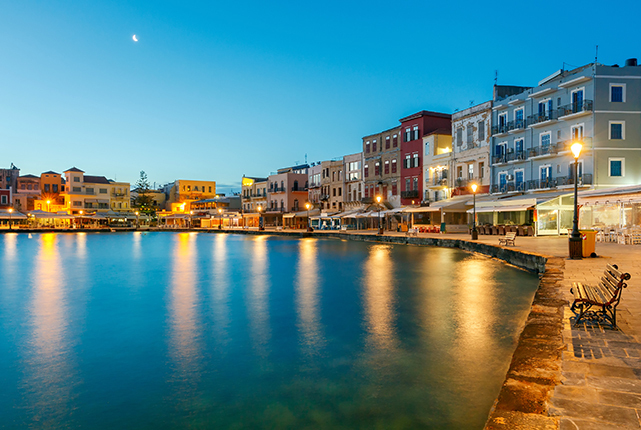 Thousands of tourists come to Chania every year to visit and admire its beauty. A part of the European path E4, it’s about 15 km long and takes about 6 hours, starting from Omalos, to reach Agia Roumeli. It is fairly easy and ideal both for beginners and advanced trekkers. Here, at the heart of wild nature, relish scents and flavours, admire wild plants and birds. Indulge in the gorge’s special scenery and immerse yourselves in this unforgettable journey! 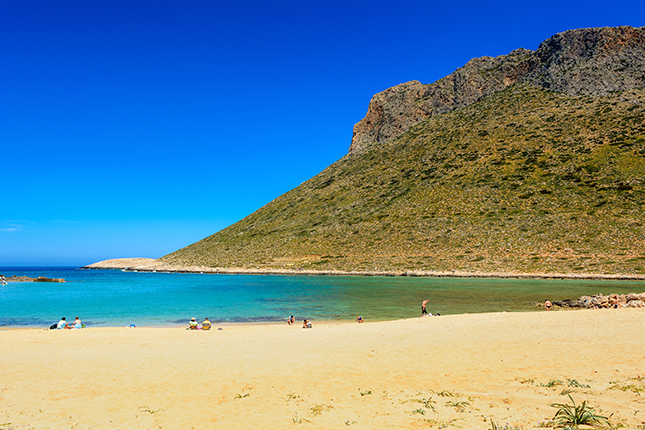 Chania has mesmerising beaches that provide a memorable diving experience. Explore the unique biodiversity and morphology of the sea floor and discover reefs, rare species of coral and fish, as well as World War II wrecks. Whether a professional, beginner or inexperienced diver, there is a programme to meet your personal needs. 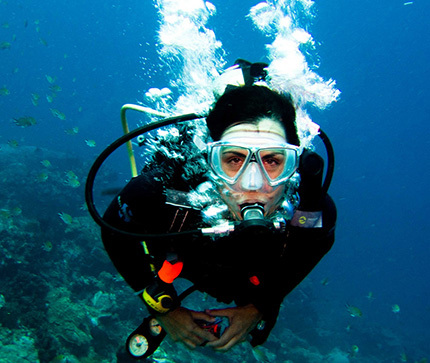 Just pick a specialised diving centre out of many in Chania running instruction services. Consult with us to inform you on diving and swimming schools across the city. 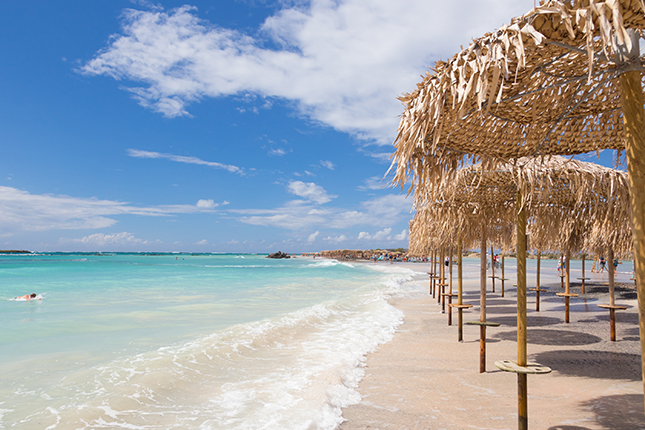 It’s hard to pick a beach in Chania, as all of them offer that something special. One visit to the Chania prefecture is not enough to discover them all; nevertheless, we suggest you explore and enjoy as many as you can. Go to the world-famous Elafonisi with blue-green waters and pink sand, or the Balos lagoon and Gramvousa Cape in all their wild and exotic beauty. 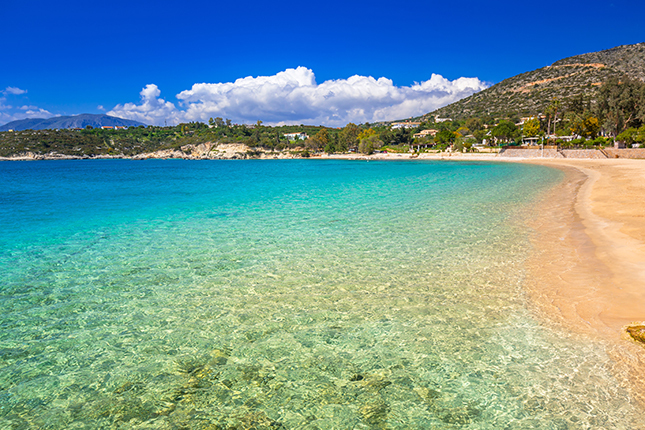 Don’t miss out a visit to the nearby beaches of Chania, like the sandy beach of Stavros, Loutraki and Marathi. All these beaches are ideal for families with children, who will have fun playing on the sand and swimming in safe, shallow waters. 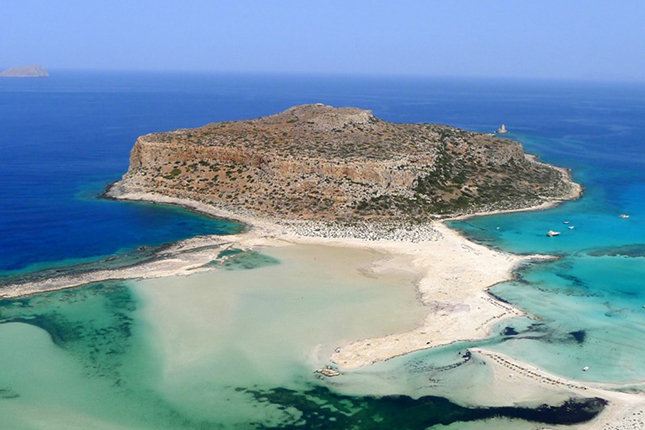 Balos lies 56 kilometres northwest of Chania, near Kissamos and Kastelli. You can reach the famous lagoon either by car or boat, from Kissamos. As soon as you reach Balos, the scenery’s wild and exotic beauty will fascinate you; turquoise waters and white sand. The sea is quite shallow and warm and is suitable families with children. However, the lagoon is ideal for diving and snorkelling, as the waters around the rocky edge are deeper and colder. Right across from Ballos, you’ll come across Imeri Gramvousa, the island with a famous Venetian castle set at its highest point. This beautiful islet of shallow, emerald waters, a Venetian castle and the chaplet of the Holy Apostles, is only accessible by boat, essentially an organised cruise around Balos and Gramvousa, as road access is not possible. Take a swim at Gramvousa Beach and explore the beautiful seabed. 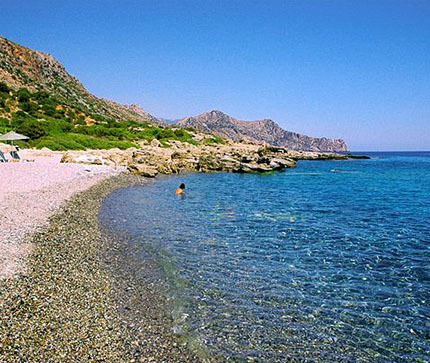 Elafonissi is located 75 km southwest from the city of Chania and is part of the Natura protected areas. It‘s an islet connected to the land via a sandy peninsula, forming a magnificent, deep blue lagoon. Known all over the world for its beauty akin to exotic landscapes and rightly so, as many call it “the Caribbean Sea of Crete”. Its charm, otherworldly beauty, crystal blue waters and pink sand formed by crushed shells, will surely fascinate you! 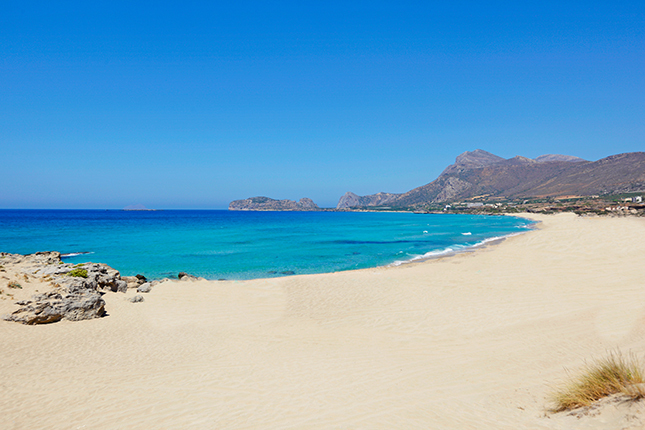 Seitan Limania Beach or Stephanos Beach is a beautiful, idyllic spot just 20 km from Chania. Seitan Limania is a fjord-like scenery that will take you aback; namely strips of sea stretching inwards between the rocky shores to create small bays. The beach is partially accessible by car, which then requires a 20-minute hike down a dirt trail. A wildlife paradise with crystal clear waters and a beach of gravel and sand will unfurl before you. 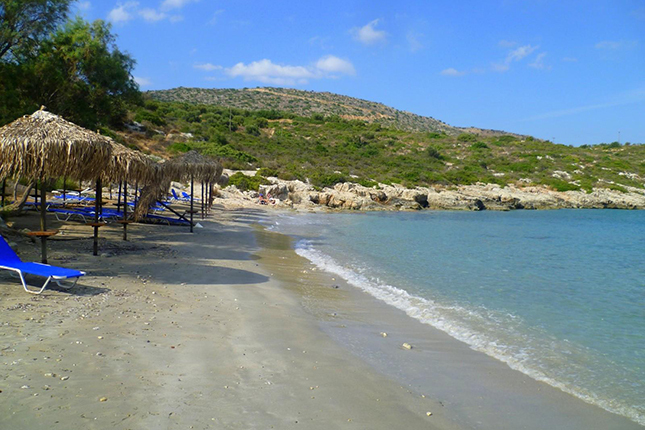 Falassarna beach lies west of Chania and, in the past, had been awarded as best beach of Crete and one of the ten best in Europe. The white sands, crystal blue, turquoise waters and lush landscape reminisce of exotic locations. The beach is 1 kilometre long and actually consists of five smaller, consecutive beaches, which are visited by people in swarms all summer long, something not really of an issue because of their size. Stay late enough in the afternoon to enjoy the stunning sunset, the most beautiful on the island! Loutraki is located east of the city of Chania, at only 16 km away. The beach is accessible only by car, as there are no local bus routes. The beach is well organized and has one café, a tavern and a seaside bar with lawn, quite popular among young people. Loutraki is the ideal place to enjoy the sea with your children, as the deep blue waters are shallow, while the beach is clean with fine sand. 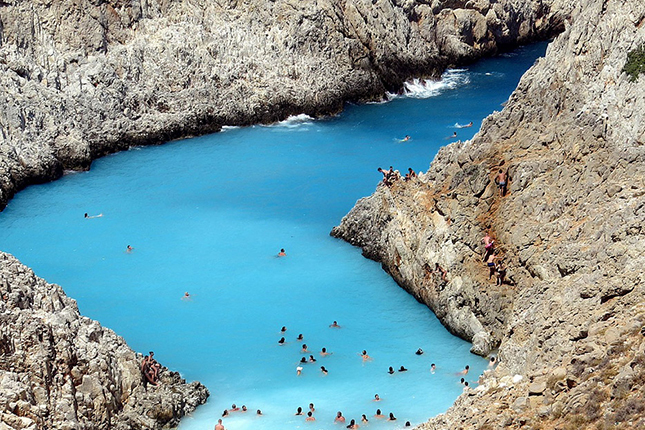 A beautiful swimming spot, close to the city of Chania, really worth visiting. Marathi is located southeast of the city of Chania at 16 km away from Chania, just like Loutraki. It consists of two beaches, with blue waters, separated in the middle by a small harbour and its pier. 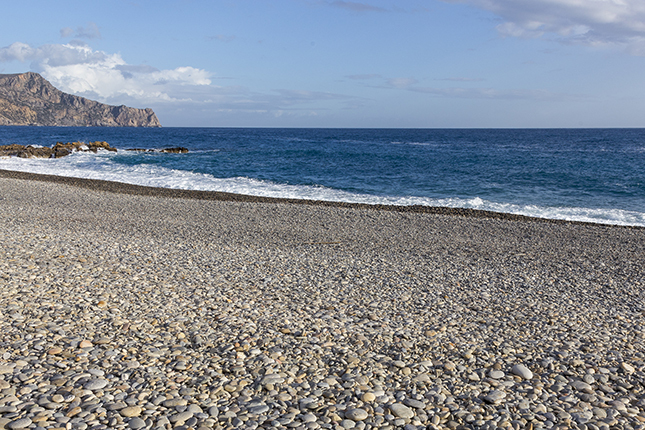 These are organized beaches with umbrellas and sunbeds, while there are also cafés and tavernas. Have a coffee or enjoy your meal while admiring the Souda bay shores and the White Mountains. Shallow waters, fine sand and the absence of meltemia (strong etesian winds) make this beach ideal for families with children. Stavros is a seaside village located 17 km northeast of Chania, in the Akrotiri area. A distinct feature of the area is the camel-shaped hill that towers opposite the harbour and main beach. The famous scenes from “Zorbas the Greek,” starring Anthony Quinn dancing the syrtaki, were shot here in 1964, on this very mountain. The beach, shaped like a small crescent lagoon, offers turquoise waters and white sand; it’s perfectly protected from winds and ideal for those days when all the other beaches are swept up by winds. The calm beach combined with the wild landscape of the mountain creates beautiful. Get there either by car or catch one of the daily KTEL buses. Chora Sfakion is the port on the southern coast of Chania at a distance of 75 km. Surrounded by the White Mountains, it includes the Samaria Gorge, one of Crete’s most popular sights. The combination of natural beauty, wild landscape and unique beaches make for a nice and yet subtle choice for a one-day trip. 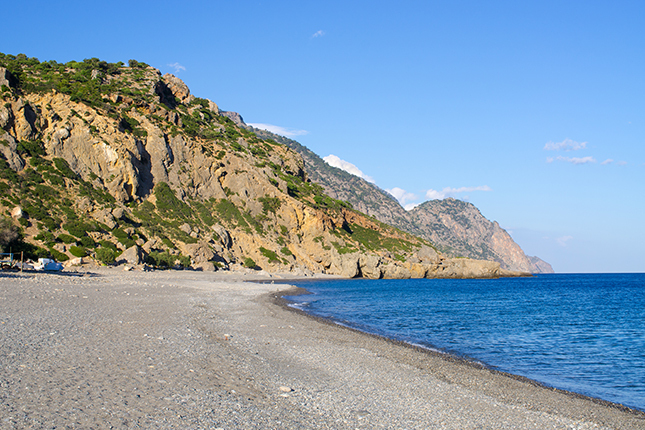 The area offers many opportunities not only to beach goers but also to trekkers, as Sfakia feature wonderful trekking and mountaineering trails. 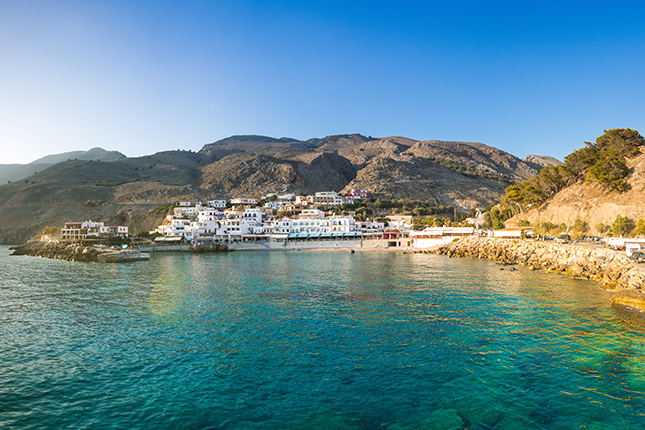 Should you want, sail on the boat to gorgeous Loutro, with crystal clear waters, and Gavdos, the southernmost island of Europe. Sougia is a small seaside village located 70 kilometers south of Chania. It has been a favourite destination for hippies, and today is a peaceful summer destination. The village stands out for its large, beautiful fine pebble beach and deep, crystal clear waters. If a fan of nudism, head east of the beach and find your perfect spot. Sougia also features restaurants, taverns, rooms to let, cafés, bars and a mini market. Paleochora lies 77 km south of Chania and is built on the ruins of the Venetian Castle of the ancient city of Kalamidi. It is a tranquil seaside area, renown since the 1970’s, as a favourite hippie destination. The beach’s crystal clear waters, the picturesque streets and activities on offer, such as surfing and diving, make Paleochora a favourite destination for both locals and tourists.